For the experiment that you devised Example 14.1, which variables can be changed, and how should they be changed, so as to shorten the time in which a measurement is made? Use a smaller quantity of ice (smaller m). Use containers with greater thickness (larger d). Use containers with smaller surface areas (smaller A). Use a lower ambient temperature outside the container (smaller T2). This is College Physics Answers with Shaun Dychko. The formula for the rate of thermal conductivity through an object is its thermal conductivity of the material times the area of it. And then, times the temperature difference between one end and the other, and divided by the thickness through which this energy is meant to travel. So, we can compare these words with this formula to see which one, which words, correctly describe this formula. The rate increases with increased temperature, that's true, because as this difference goes up, then this will go up. And, surface area, yes, that too, eh? 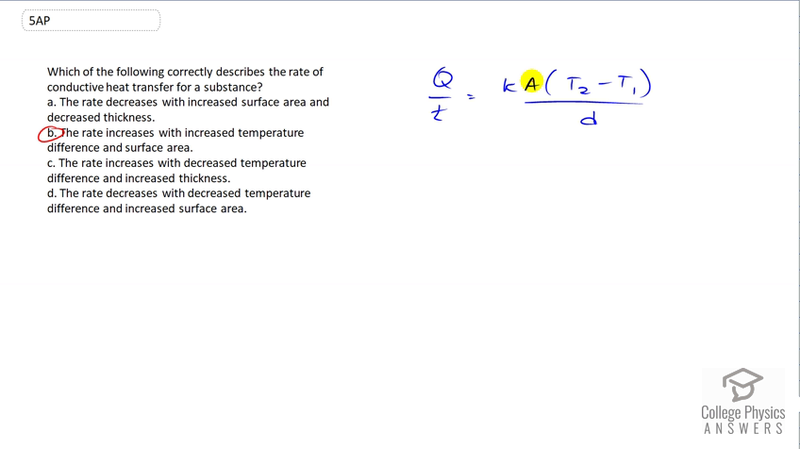 If you have area increasing, then you also will increase Q over T. And so, B is the correct answer. Well, I guess we can exclude the other ones if you like. So, the rate decreases with increased surface are. Well, that's the opposite of what we're seeing here. Rate increases with increased thickness, nu-uh. As this D goes up, as the denominator of a fraction increases, the quotient or the result of division decreases. So, having a bigger number in the bottom makes the result smaller. And so, that's the opposite of what this is saying here. The rate decreases with decreased temperature, that's true, actually. Increased surface area. Well, that's not true. So, the rate does not decrease with an increased surface area. As A goes up, the rate goes up as well. So, B is the only correct answer.